We shipped it. After several months of hard work and a lot of finger-crossing come review time, the iMore for iPhone app hit the App Store last week. And wow but guys gave it a great reception! From the sheer number of downloads to the incredible feedback we've gotten, you've absolutely knocked our collective socks off. Everyone from iMore, Nickelfish, and Mobile Nations worked really hard on it, so we're thrilled that so many of you like it so much. We're already hard are work planning out the next version, including iPad support and much, much more. So make sure you get your feature requests in now! Week before last I wrote a story about the iPad mini, the still-mythical 7.85-inch smaller sized tablet that Apple has in the labs but may or may not choose to release (tl;dr: Apple's a go-to-market company and they won't release an iPad mini -- or any new product -- until there's a compelling and profitable reason to do so). 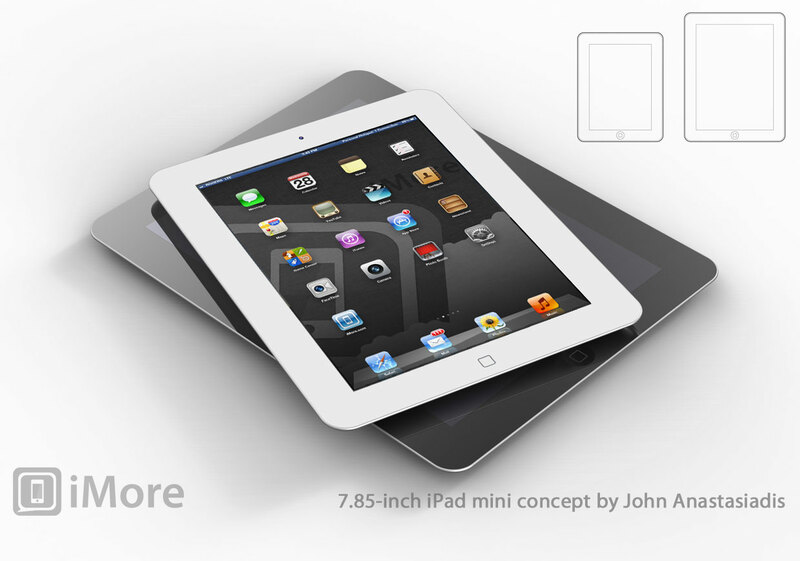 Last Wednesday John Gruber of Daring Fireball, who has excellent Apple sources, said on his podcast that he'd heard pretty much the same and went over his own list of why and why not we may see an iPad mini (or iPad Jr.) soon. Fredrico Viticci of MacStories and Matthew Panzarino of The Next Web weighed in as smartly as well. The iPad mini, like the iPhone nano, remains something Apple won't do because they can, but will do when they feel they should. When could that be? Gruber speculated that an iPad mini could be a WWDC 2012, though we're still hearing that, once again, there won't be any new iOS hardware this summer. Speaking of John Gruber, he had an interesting back and forth with Sebastiaan de With of DoubleTwist over the tension between simplicity and obviousness. These challenges aren't anything new of course, even in mobile. Going back to the Newton, Palm Pilot and Handspring/Palm Treo, Windows Pocket PC and Windows Mobile, there have been app launcher Home screens and simple, zen-like user interfaces. (Palm was famous for "counting clicks" to minimize how long it took to do something with Palm OS.) You want interfaces to be simple and obvious for users, but the focus isn't the simplicity or obviousness, but the users. You match the tool to the job, not the other way around. When Apple (or any designer) succeeds, whether it's with something as utilitarian as Mail for iOS, it's because the UI is so consistent and clear you barely notice it. It's when my 2 year old godson can unlock an iPhone or iPad, navigate to his favorite game or app, launch it, and use it. Well. It's when my mom can discover, download and install, use and recommend apps in a way that encourages and delights her rather than frustrates and shames her. It's not about chrome or no chrome, buttons or no buttons, gestures or no gestures, simplicity or complexity, it's about balance. It's about usability. It's about accessibility. Apple is smart about this. iOS has the basic Home screen and that's all you ever really need to use. If you want more, you have the gestures, the fast app switcher, Notification Center, etc. Likewise on the Mac, a Unix geek can live in Terminal, a regular user in Aqua, and a new-to-the-Mac iOS user can easily relate to Launchpad. When the right elements are in the right place, that's when everything from an OS to an app feels simple and obvious. Since it's baseball season, let's go inside baseball for a moment. Every once and a while bloggers get stressed over how stories are sourced. We all work really hard on original content and exclusive reporting, and when we do a good job it's rewarding to get recognized by our peers with links back to that work. iMore clearly and consistently places source links at the bottom of every article, so that readers can quickly and easily find where each and every story comes from (if they come from somewhere else). We also take pains to drive traffic back to the originating source, so they're encouraged to make more great content, and we have more great content to link to in the future. If the author deserves to be highlighted outside the body, if the date, if the tag, if any number of other meta attributes deserve to be singled out and made noticeable, certainly the source link does as well. Obviously there are limits and exceptions -- articles with multiple sources, like this one, can't clearly attribute each one in a source field so I'm linking in the body -- but that's where flexibility and editorial judgement are important. It's really the intent that matters. Good sites with good editors will get it right. They'll find the correct source and attribute it correctly -- and every reader will know where every story comes from, be it the site itself or some place else. 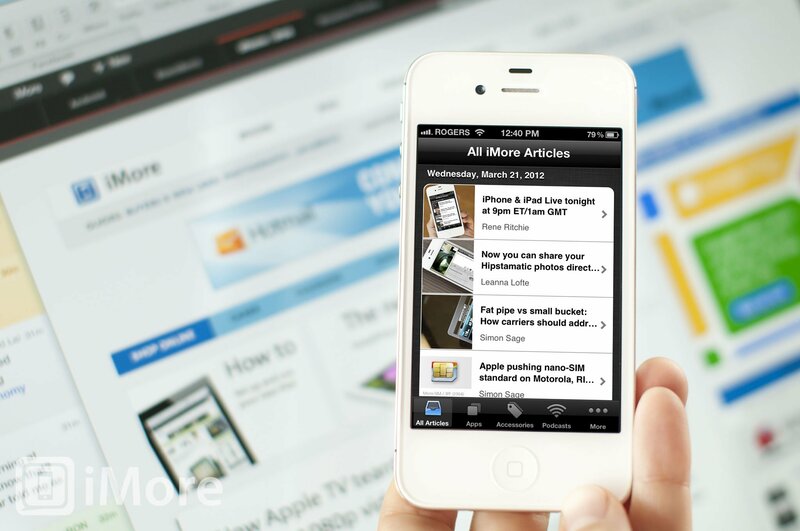 Going from inside baseball out, once again we had some great features on iMore this week. Best iPhone and iPad apps for Major League Baseball fans: Gary handed us all a hotdog and tasty beverage, and showed us how to get the most out of opening day. Weekly Photo Contest: Flowers! : Leanna kicked off our new series of iPhoneography contests, just in time for spring, and entries so far are outstanding. Make sure you get yours in asap! How to fix a cracked or broken screen on the Verizon or Sprint iPhone 4: Ally's taking her DIY iPhone repair series to a whole new level. If you're using an older device, she'll absolutely help you keep it going as long as possible. 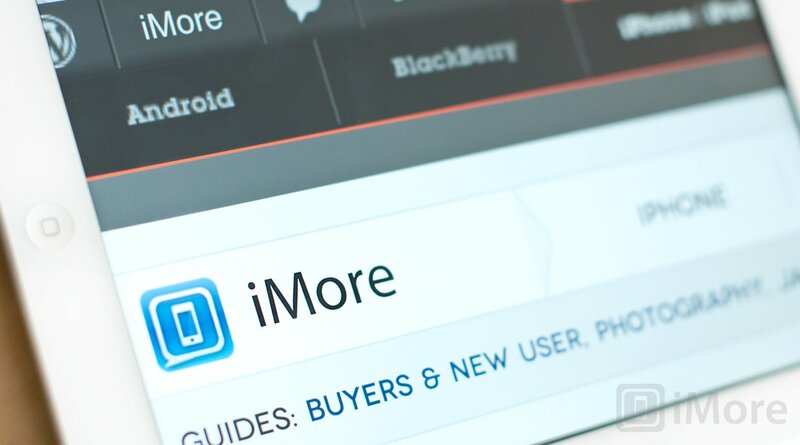 Making the right choices: How we designed and developed the iMore for iPhone app: Seth opens his kimono (figuratively speaking!) 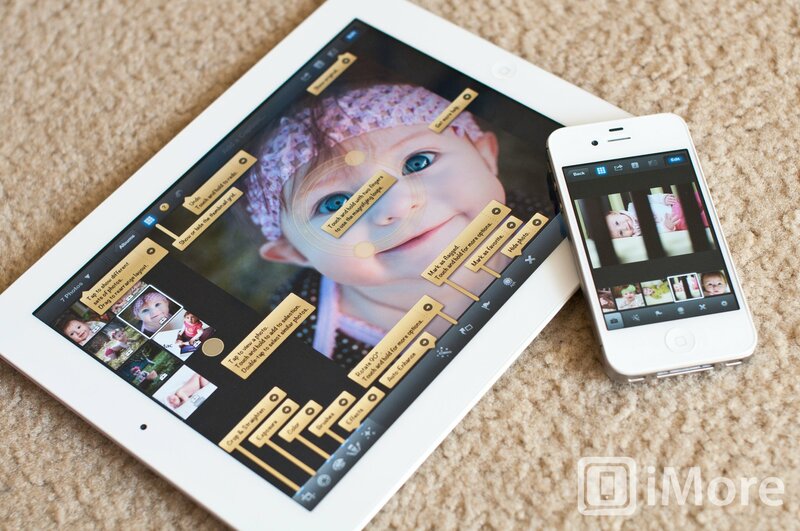 and explains the thought process behind the new iMore app. How to use your iPad in direct sunlight: Georgia and Steph show how polarized sunglasses can be used to more easily see your iPad display in direct sunlight. They also point out it's not the orientation, but how different sunglasses require different orientations to work properly. I for one welcome our new Android Instagrammers: There was a lot of angst and acrimony surrounding the arrival of Instagram on the Android platform: It was silly, so iMore brought out the welcome mat and invited them on a photo walk. Great Artists Steal: Yours truly weighs in on the difference between being inspired by what came before and using it as a springboard to create something new, and simply copying someone else's implementation as closely as possible. If that's not enough to tide you over, here are some great articles from around the web that I enjoyed this week. Anil Dash Calls Foul by Benjamin Brooks is the latest in Brooks' excellent series of articles on Readability's business model and the concerns it raises for some publishers. Searching for a rational reason to hate a manufacturer's UI by Phil Nickinson tackles the interesting issue of the love/hate relationship some Android users have with manufacturer specific interfaces from the likes of HTC. Welcome to iTextEditors by Brett Terpstra breaks down dozens of iOS text editors by dozens of feature sets in an effort to help compare and contrast them. How to check for—and get rid of—a Mac Flashback infection by Jacqui Cheng breaks down the first massive Mac malware attack (that we know of), tells you what it is, how to see if your Mac is infected, and what to do about it if it is. From the Editor's Desk: Last blog standing by Derek Kessler takes the look at the state of webOS blogs, then straps on his Roosevelt pants and vows webOS Nation has only just begun to fight. Four and a Half Years On by Stephen Fry takes a look at everything that's happened in mobile since the introduction of the original iPhone, as only Stephen Fry could look at it. Care-taking and The ultimate bucket list are the latest two episodes of ZEN and TECH, which is the most important show Mobile Nations does. There's a lot we can do to help you improve your smartphone or tablet. This show will help improve your life. I can't recommend i enough.